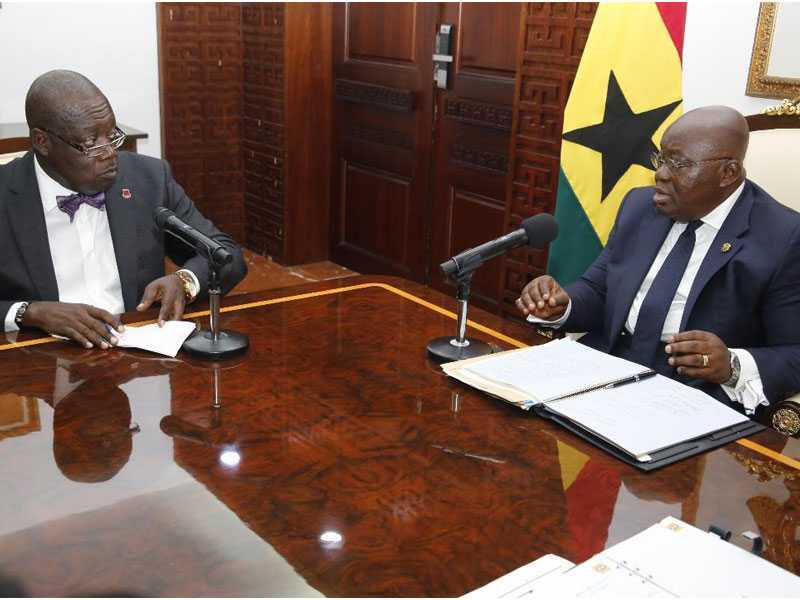 President Nana Addo Dankwa Akufo-Addo on Tuesday assured that government is taking measures to fix the fragility of the Cedi, urging a greater dependence on local goods and services, and not on exports by the citizenry. The President gave the assurance in an interaction with the leadership of the Ghana Bar Association (GBA) at the Jubilee House in Accra, at which the association raised concerns about the fall of the Cedi against other trading currencies, and the current energy situation in the country. He told the GBA that the depreciation of the cedi was the result of over dependence on imports for sustenance by Ghanaians, indicating that the issue was a major worry for his government because “the difficulties that temporary dislocations in the currency brings about touches all of us and there is a need for us to find solutions. “There are structural problems that we have so far not articulated loudly in my view. We live in a country where we are overly dependent on the importation of things for our daily sustenance; things that we can produce, we continue to import them and at the same time, we don’t generate enough exports. “It is the issue on the persistent deficit in the national income statistics on current account that is what gives rise to the frailty of our currency…This is the matter that we should all understand as the origin of the real fragility of our currency,” the President stated. “This is the importance of this One District, One Factory initiative. It is not just a political gimmick. It is an attempt to address the issue of being more self-reliant. This whole Ghana Beyond Aid mantra that is now broad; is about self-reliance, of doing for ourselves things that we continue to depend on other people to do. “When you buy things from abroad, you are creating work outside Ghana which you could create inside this country,” he said, insisting that Ghanaians ought “focus more on being competitive in our attitude on the things that we produce. “Last year we produced a lot of food [and] we were able to make significant money from it in exporting to our neighbours…this is the discussion we should be engaged in as a nation and focus on what it is that we need do as a nation to turn around that narrative, to turn around the fragility of the currency because the days of fixed exchange rates; those days are over. “Yes, the Central Banks can intervene to assist in one way or the other, but ultimately the market forces that determine the state of the currency. If you are spending the money you don’t have invariably you are going to find yourself in problem,” the President said. He was hopeful that the effects of the impact of Government’s intervention in the matter would be roundly felt in the shortest time. The GBA also raised issues about the need to uphold the rule of law in the country, which President Akufo-Addo called for support from the entire citizenry to address the increasing culture of impunity. He said though Government had the responsibility to ensure a law-based state, the wider society should be involved in the process of making the country one of law and order. “I believe that calling on the executive to be alive to its responsibility is the right civic responsibility you are discharging,” he told the GBA, adding, “I am sensitive to it and accept the challenge to ensure that our society is not one that condones impunity. Touching on vexed issues of vigilantism, the President noted that phenomenon “forms part and parcel of the acts of impunity that we need to deal with. “We are dealing with it in difficult circumstances…there is still considerable unemployment, so its relatively easy to co-opt the young people into all kinds of dangerous activities. But we need to come to grips with it and I want to assure you that whatever steps that need to be taken to deal with the issue of nominal impunity, I am going to do my best to deal with it. “I call for your support and the support of right-thinking citizens in our society to continue the effort that is being made to drive impunity out of our system and uphold and safeguard the rule of law,” he said.